Frugal and Thankful: Food waste and a menu, week 6/30-7/6. Food waste and a menu, week 6/30-7/6. How was your Monday? I hope you all had a good and quiet day. And since our fridge was pretty bare, I had to go shopping today. I got a few good deals, so, hopefully, everything I bought will last us for the next two weeks or so. Fr. - grilling (chicken, veggies, potatoes)!!! And what are you eating this week? Any special menu for the 4th of July? We don't have a special menu planned for the 4th of July because we are leaving on a trip early the next morning. However, I will be interested to hear what others have planned. How fun! Where are you going? Oooh, the Russian slaw looks great. Especially love that it calls for a pepper, since we have about 20 of them waiting on the vine to be picked! Take care of yourself over the holiday, I drank black tea when I was really sick and pregnant. It was the only thing I could keep down, I know against our standards but it was that or IV's at the hospital. Hope you feel better. Yum! Your menu sounds delicious! But I know what you mean. I try to stay away from the kitchen right now... We will have triple digits here today... Yuck! Good job on getting the fridge cleaned out - I need to do that and clean our deep freeze too! 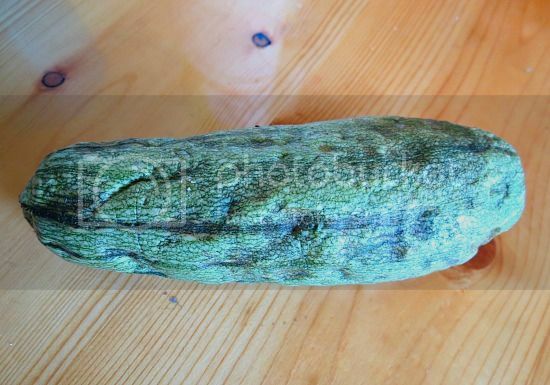 Haha... What a sad little cucumber. ;-) Hope you have a great Wednesday!